It may be a cats’ world and we just live in it. But when it comes to brick-and-mortar pet stores, there’s a noticeably stronger focus on that other species: You know, the one that claims to be man’s best friend — the dog. Perhaps it’s because dogs are indiscriminately eager to please and thus make great customers because they will eat and play with just about anything. And further, because dogs are more likely to go shopping with their pet parents, there’s no question that pet stores, particularly the smaller boutiques, are more dogcentric with regard to the merchandise they stock. Consequently, when it comes to cats, the selection of food and treats, toys, leashes, carriers, litter boxes and other accessories like scratchers and condos is smaller and sometimes even nonexistent in smaller specialty stores. And this is a primary reason why cat parents turn to their computers and smartphones to shop the vast array of products available online from both big retailers as well as smaller, more unique web-based stores. Besides, nothing beats shopping with a cat on your lap! Always be sure to check the policies where ever you decide to shop. Photography ©slyudmila | Getty Images. First, let’s go big. When shopping at large online retailers, pay attention to the specifications of the products you are looking at buying. Take litter boxes as a buyer beware example. The specifications, including measurements, are included but don’t necessarily spell out exactly what they are measuring. If the box has an extended handle area on the sides, a big lip and/or a lower entry level that protrudes, the measurements may take these extremities into account but not reflect the most important measurement — namely the base area of the box (the area covered with litter that determines whether the box is big or small). It’s the most important litter box measurement, especially if you are purchasing for a very large cat. With large online retailers, reaching out and asking questions about things like specifications may not bring a prompt response or even additional information, as it may not be the policy of the retailers to go the extra mile to obtain more information from the vendor on your behalf. These online retailers do put their policies and legal positions online, so it’s up to cat parents to read it even if it is cumbersome. The good news is that the larger online retailers soften the blow with regard to shopping mistakes with great return policies and by enticing you to spend more with the promise of free shipping. But be aware — free shipping is not always on goods being returned, too. If there are smaller retailers that operate stores on the site, check that retailer’s policy, too. If the return policy isn’t easily found on the website, some large online retailers do allow you to chat with customer service. It definitely pays to try and ask questions before a purchase using a retailer’s online chat facility or toll-free number because this will rule out the laborious task of having to return something. The online shopping experience also includes a lot of manufacturers that have a shopping option on their own sites. In this scenario, you are dealing with the manufacturer directly and cutting out the middleman in terms of answers to your questions. You can email or call the company’s consumer hotline for instant information. 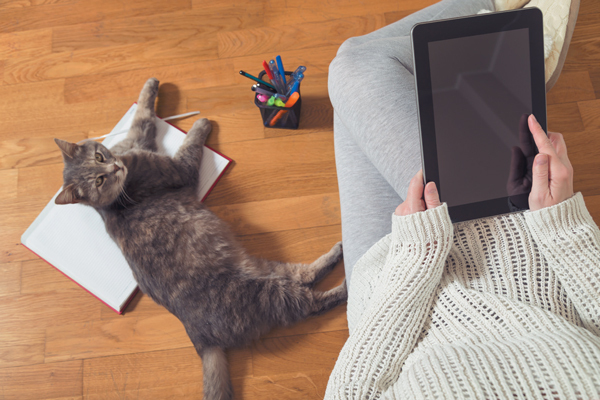 The third category of online stores belongs to smaller manufacturers, who thrive on building relationships directly with their cat-loving customers. These smaller online store owners tend to closely monitor their inboxes, and responses are often instantaneous. 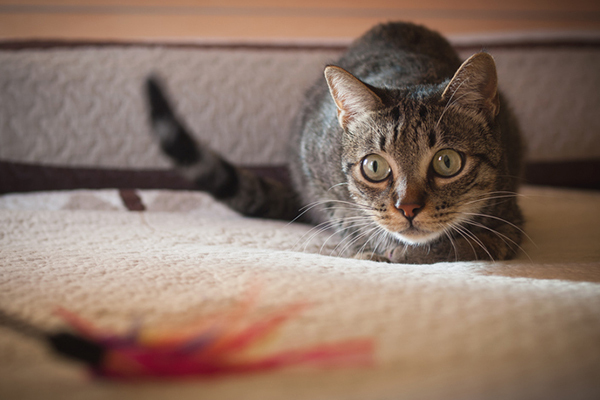 Cat toy manufacturer Dezi & Roo, the creator of the ever-popular original Hide-and-Sneak paper cat tunnel is typical of such smaller vendors. The company operates a store on its website and also sells products on Amazon. “When customers look on Amazon for one of our products, that is typically what they see — that one product. In contrast, on our website, they are able to peruse everything we manufacture,” says company owner Lynn Bahr in explaining the different shopping options. 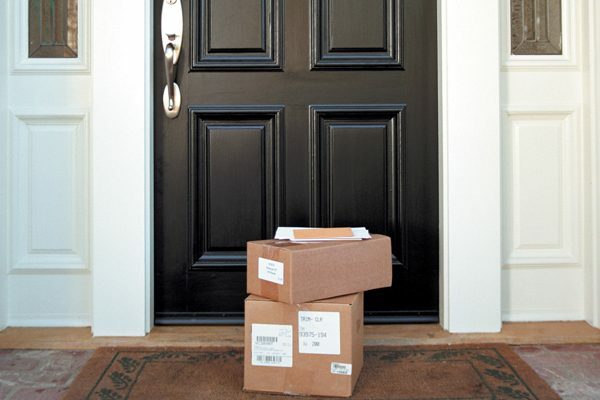 There’s no question that when it comes to heavy items such as cat litter or cat condos, there’s an advantage to having the goods delivered to your doorstep. 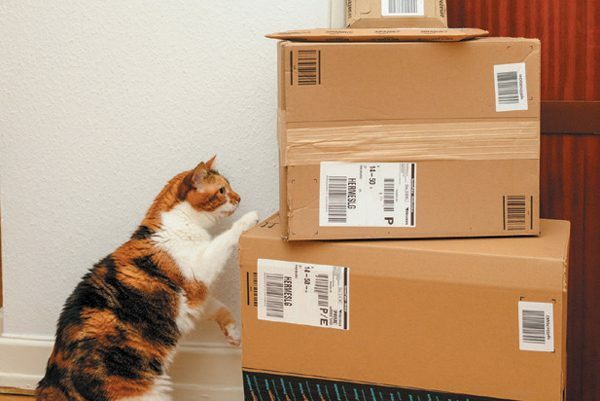 It’s easy to stockpile litter, and purchase enough canisters or bags to qualify for the free shipping that sweetens a weighty deal. Manufacturers are catering for such online deliveries with regard to the way they package big items like condos and provide detailed assembly information so that customers can easily build the item at home. Another plus for online shopping is that websites usually offer special prices to celebrate certain holidays and events throughout the year. And you can save on repeat purchases if you sign on to their loyalty auto-ship programs, which from time to time also offer specials to members. 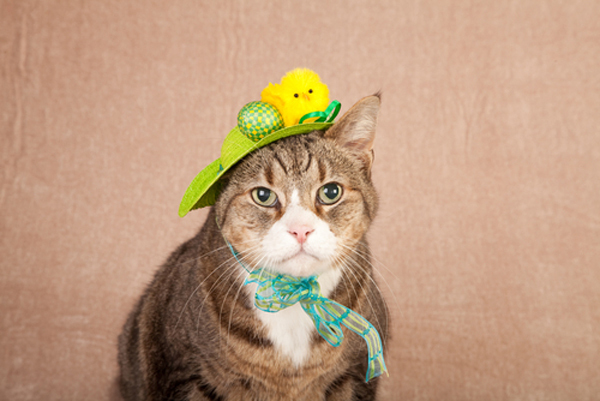 By shopping in-person you get the chance to talk to someone directly about your favorite feline. 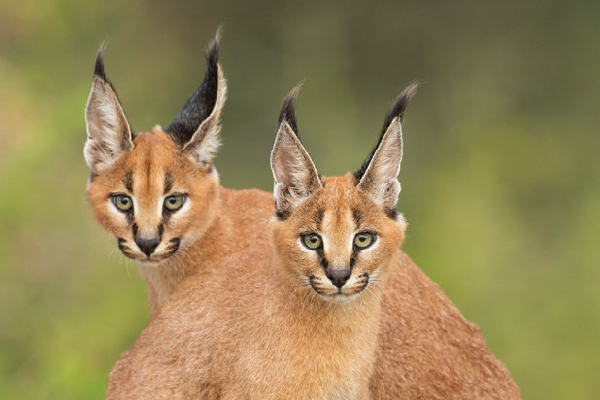 Photography ©Craig Bullock | Animal Haus Media. It’s easy to purchase food online if you know what your pet eats, and it’s a safe bet to stock up. Also pet food manufacturers usually have a return guarantee. (They understand finicky felines!) But when it comes to wet food, one of the biggest disadvantages to shopping online is that you may be forced to purchase a case of one particular flavor. 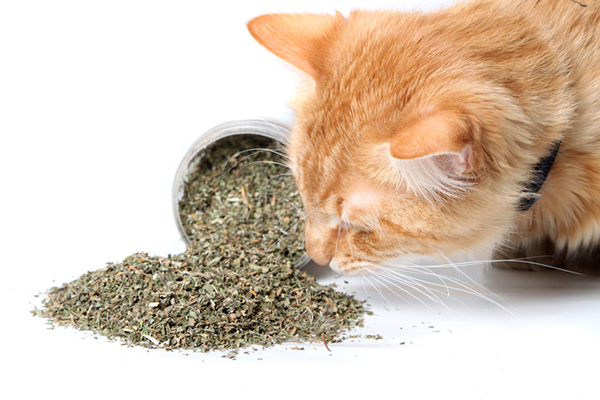 This doesn’t always sit well with cats who enjoy a variety of proteins or if you are exploring new options. In contrast, that’s a big advantage to shopping in a brick-and-mortar store and purchasing single cans or pouches to give cats more variety and to experiment with new tastes and flavors. Also, dedicated store owners see their role as more than just shopkeepers but as educators, too. They closely follow food trends (and other lifestyle trends) and usually have great relationships with manufacturers to ensure they have the latest information at their fingertips, which, in turn, they are able to pass on to cat parents possibly looking to change a cat’s diet, manage weight issues, hairballs and more. 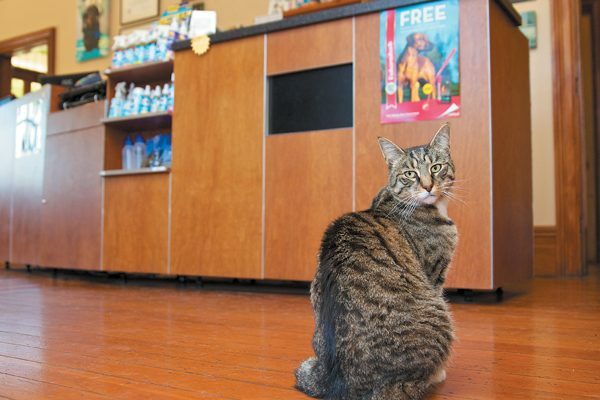 If you are lucky enough to have a catcentric boutique store in the neigh- borhood, there is definitely no substitute for going in to a store to learn about the latest trends and foods that collectively work to improve your cat’s general health as well as mental and physical well-being. Also, the number of pet specialty stores now offering loyalty programs to entice repeat business is growing. And many are also beefing up their own individual online stores. There is nothing like the experience of discussing your favorite feline with someone who is really interested in hearing your story and sharing their opinion regarding your cat’s needs. And even if you see products firsthand that you may later even purchase online, that knowledge and experience gleaned in a store is a fabulous way of reinforcing and enhancing that wonderful human-animal bond with your cat. And besides, there is no way of packaging this hands-on advice and delivering it on a cardboard box on the doorstep. Always look for coupons on manufacturer’s websites. Photography ©AdrianHancu| Getty Images. Because there is so much new research going into new recipes, cat food companies have telephone hotlines manned by consultants who can explain the different tastes and textures available across their various brands. Some will offer to mail coupons to customers looking to try a new food for an in-store purchase. Also, be sure to check individual pet food manufacturer’s websites, as they also do offer coupons that you can print and use in a store, too. “To help bring a similar experience with regard to offering a variety of wet food flavors to online shoppers, we recently launched variety packs of canned cat foods,” says Jenny Condon, Vice President, Ecommerce for Merrick Pet Care. “The packs offer a variety of three poultry recipes or three fish recipes. However, we believe that when it comes to food, there is definitely a synergy between shopping both in a store and online. And this trend is endorsed by the 2017 Packaged Facts National Online Pet Owner Survey that detailed that although 56 percent of pet parents have purchased cat (or dog) food online, only 2 percent shop exclusively online,” she adds. If you’re not sure whether your cat’s favorite wet food comes in a variety pack, a call to the company’s hotline will spell out the details, as variety packs aren’t often featured on websites. It can and does happen. There are various ways to tackle the problem. However, all involve keeping a detailed account of your attempts to return a product and get a refund. The USA.gov website offers a free Consumer Action Handbook, a resource guide that provides general information on shopping and tips about consumer rights. It also details how to lodge a complaint. If you have tried dealing with a website to return goods and be reimbursed with no success, consider contacting your credit card bank. If you can provide evidence that you have tried, they will take over, credit your account and deal with the vendor directly. Take to social media. If all else fails, politely posting your story will bring a response, which you can then take off-line and resolve. No company likes to have its image tarnished on social media.